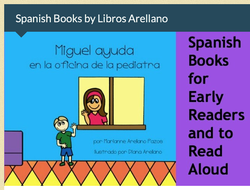 read a review of our spanish books on spanish playground! Spanish Playground reviewed our books! We are so pleased that they "got" our work! We aim to make books in Spanish that are relevant and fun for bilingual readers. Read a review of our books on everythingSAHM.net! Everything Stay At Home Mom did a fantastic review of our books! We feel they really captured and appreciated the essence and purpose of our books. Read Reviews of our books on amazon.com! Very cute book. Keeps my kids engage while they are learning animal names in Spanish. It is hard to find books in Spanish that they like, but they really enjoy reading this one at bedtime. Very cute book. My kids are learning Spanish at school and really enjoyed reading this one with me. Drawings are adorable and help them learn words in Spanish that they would find at the supermarket.